Welcome to 'Sweet Sara's'. This home is one of 8 houses in a secluded Lake Michigan bluff neighborhood. Sweet Sara's is a newer country home where no attention to detail has been spared -- a true 5 star accommodation. It's a perfect getaway from the city or a great meeting place for a girls' weekend away! Come up for a fun weekend for St. Joe's annual events... Chili Tour, Beer Fest, Ice Fest and more ( Then sip your hot chocolate in front of the slate fire place while you enjoy your privacy in this beautifully appointed home. Walk the singing sands of Lake Michigan beach, watch the ever-changing sunsets from the bluff, celebrate the spectacular colors of autumn or sip hot cocoa in front of the fireplace on a snowy day. Whatever the season, the experience is always inspiring and delightful. Take a short drive on scenic highway M-63, hugging the Lake Michigan shoreline, north to South Haven or south to St. Joseph and find good food, live music/theater, unique shops, museums and art galleries. Each town has its own lighthouse and boat-filled harbors, featuring individual charm and unique attractions -- memories you will not soon forget! Originally from Glen Ellyn, IL. Fell in love with the area in 1987. Built new in 2000, when I became a full time resident. You will love the private beach here at Sweet Sara's -- everyone does. Take a swim, read a book, walk the "singing sands" for miles in each direction, it's all so good. 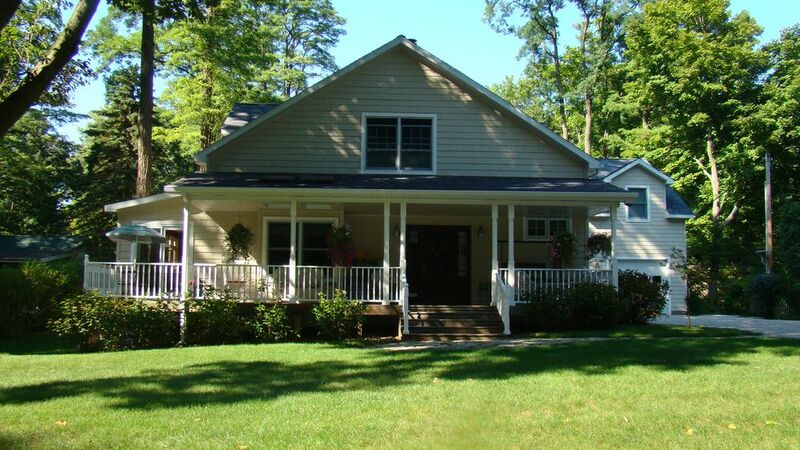 We are located a short drive to St. Joe, South Haven, Saugatuck, Holland. The wine country here in Southwest Michigan offers lots of individual wineries and fun group tours. Golf courses are some of the best, with Harbor Shores (a Jack Nicklaus signature course) right down the road, which hosts the Senior PGA every other year . One cannot visit St. Joseph without experiencing the Silver Beach Carousel, the Whirlpool Splash Pad, the Curious Kids Museums. Many of my guests claim that South Haven has the best Farmer's Market, and Saugatuck offers a place to visit more unique shops that you can fit in a day! Ceiling fans throughout, skylights, central air, fully equipped gourmet kitchen, gas barbecue grill. 4 large bedrooms, 1 king, 2 queen, 2 double, 2 twin. No pets and no smoking on premises. $200 cash cleaning fee will be collected upon your arrival. Guests are asked to bring their own beach towels and chairs, and any extra towels besides the 8 provided. Please call for long term rates.